In the years 1901 - 1903, Lionel S. Mapleson recorded a number of cylinders at the Metropolitan Opera in New York. Mapleson used an enormous horn at a considerable distance from the orchestra and singers, and the quality of the sound is said to be extraordinary. The cylinders later came to form part of the Rodgers and Hammerstein archives in New York. In 1979, the archives began a project of reissuing the cylinders on vinyl. The first thing needed was a player, and Art Shifrin was commissioned to build one. The drive is an Ampex tape recorder motor, mounted on springs. It has full and half speed, and drives the mandrel by a belt around the flywheel. The motor axle has three different diameters, for 120, 144 and 160 rpm, and the belt is moved by a twitch of the hand to change the speed. Mandrels can be changed, and there are three different sizes. 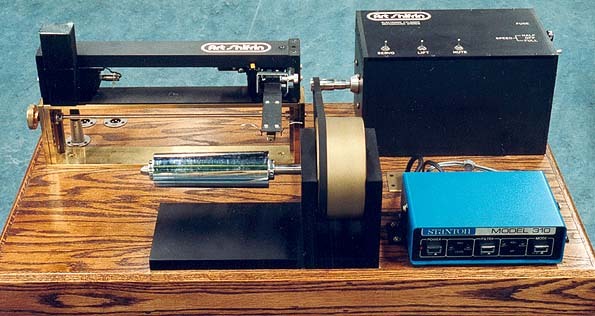 The tone arm is a battery powered tangential Rabco SL-8E, modified to move faster. It can be raised and lowered to play different size cylinders. Then in 1980 the head of the record library at the Swedish Broadcasting Corporation, Claes M. Cnattingius, on a trip to New York heard about Shifrin's phonograph. The library had been looking for a solution to the problem of making use of its 1500 phonograph cylinders. So Mr. Cnattingius listened to the player and liked it. Next year Art flew in with a new phonograph (the one pictured above), set it up and instructed the sound engineers. 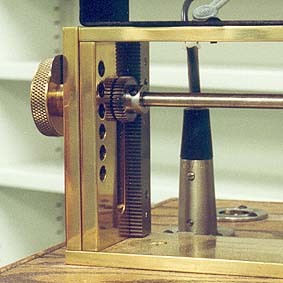 The height adjustment for the tone arm assembly. Part of the collection of styli. 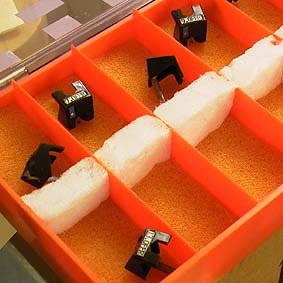 The styli come in 13 different sizes, radius 63,5µ to 508µ (the common size for 78 rpm disks is 65µ). Preamplifier is a Stanton 310 without corrections. One thing that may not be discovered anywhere but in a professional studio is that the recordings are not always cut perfectly vertically. 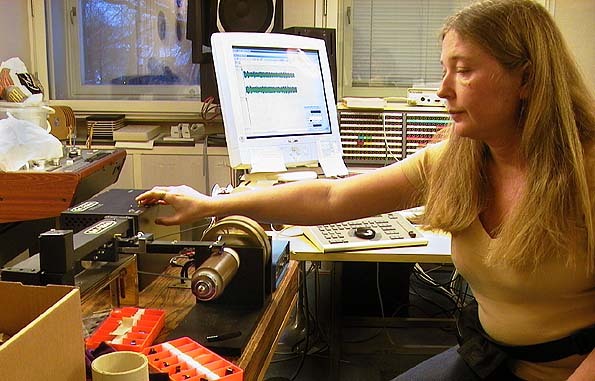 Any deviation from vertical can be corrected in a control table, according to the sound engineers at the Swedish Broadcasting Corp.
Harriet Lundberg transfers a cylinder to digital form on the Shifrin player in the record library. For the needs of the Swedish Broadcasting Corporation's record library, some 800 cylinders were transferred to reel-to-reel tape in the 1980's. Now a new set of cylinders, some 1200 in total, has been transferred to Exabyte digital tape, which is believed to last long enough for archival needs. From the tapes, listening copies are made on CD. The sound is then processed digitally, but a straight recording is always preserved as a reference. Due to recent loss of staff, the record library found itself almost devoid of expertise in the field. Work is now conducted by Harriet Lundberg, who has had to reconstruct this knowledge, mainly by personal contact with experts in Sweden and all over the world. Books have been of little use, she says. As the project was completed in April 2003, the joint cylinder catalouges of the record library of the Swedish Broadcasting Corp. and the National Archive of Recorded Sound and Moving Images were made available at the Archive's site. For some 700 of the cylinders you can also hear the sound - processed or unprocessed, according to the collection in which the cylinder is to be found. This phonograph has also been used for other collections of cylinders, for instance the Laurell cylinders containing some of the oldest Swedish folk music recordings (1913 - 20), released in 1999 as a triple CD on Musica Sueciae / Caprice CAP 21604.